CSFP is fortunate to partner with a large community who believe in our mission and the power of education to transform lives. One of those people is our Board Chair, Pat Burke. CSFP Board Chair Pat Burke, with the Phillie Phanatic and our 2018 Teachers of the Year, onstage at the Kimmel Center. As Board Chair, Pat provides critical oversight of CSFP’s operations and governance, as well as insight on our program. In addition, he champions our mission in public, and often serves as emcee at CSFP events. 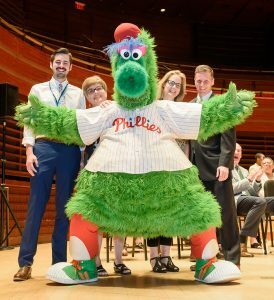 If you have attended our Student Awards Ceremony or a Lottery Day celebration in the past, you’ve probably heard Pat praise the accomplishments of our students and families, or seen him hand out awards to CSFP students while joking with the Phillie Phanatic. Besides acting as Board Chair, Pat is the Managing Director at Mill Creek Capital Advisors, LLC. He lives in Chester Springs with his wife and three children.